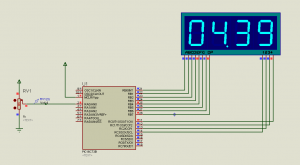 In this article, we have come up with a new PIC micro controller project. Our author Mithun has created a Digital Voltmeter Circuit using PIC16F73A and multiplexed 7 segment displays. The circuit is well explained with diagrams and the source code (written in Embedded C language) is available for download. If you have any doubts while implementing this project, please feel free to ask in comments. Here data is send thorough ‘a, b, c, d, e, f, g’ lines and ‘s1, s2, s3, s4’ are the enable lines. When data is send via the data bus and s1 is made high,the data will be shown in the first segment. Similarly when s2 is made high, data will be shown in the second segment. 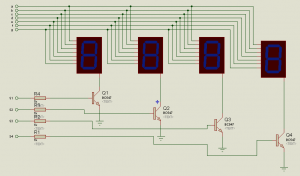 This is how multiplexed seven segment display works. But now the question is how can we show different data in these 4 segments at a time? Remember, human eyes can’t find the difference within 10ms. I hope you already know about the persistence of vision. If we can change the data with corresponding enable pins of all these 4 segments within 10ms, our eyes will see a set of 4 digits in this segment. In other words, we will do the following within 10ms to display 1234. Feed data bus with 1 and set S1 high. Feed data bus with 2, turn S1 low and set S2 high. Feed data bus with 3, turn S2 low and set S3 high. Feed data bus with 4, turn S3 low and set S4 high. All this has to happen with in 10ms. Finally the process repeats to keep the display stable. First of all we need to write codes for the correct timing, so that we can send different data at different time by keeping high corresponding enable pin of the segment. So we need to make use of the timer interrupt. I prefer you look the circuit diagram in detail now. Microcontroller fetches the analog signal through the AN0 pin of PIC16F73. The built in ADC of PIC16F73 converts the analog input to its digital value. A fractional conversion is applied to this digital data using an equation and the data is converted to millivolts. Each digit is extracted one by one using the sub routine void display(). The extracted digit is matched and the corresponding seven segment pattern is fetched from the LUT written inside the mask subroutine. The data from LUT is then passed to data bus of the multiplexed 7 segment display using pins 21 to 28 of PIC16F73. The enable pins are connected the micro controller at pins 11, 12, 13 & 14. Finally different data are sent to different segment displays by alternately switching the enable pins within 10 ms. This way our eyes see just a 4 digits number. So here is our full project.